NEW YORK CITY, November 15, 2016 – In a thrilling sprint finish, Flavio De Luna Davila took the win at the GFNY Cozumel, defeating Joao Fernades Oliveira and Carlos Hernandez Santana (all from Mexico) after racing 160km in 3:55:22, in hot, humid and windy conditions. Defending champion, 2016 Olympian and acclaimed climber Luis Lemus (Team Cycling Academy Pro) guided his cousin De Luna Davila into perfect position for the sprint out of a 15-racer group. Meanwhile Team Trek-Segafredo pro Julien Bernard suffered from dehydration in the relentless tropical heat of the paradise island. Professional triathlete Celine Schaefer from Switzerland, who lives in Cozumel, was used to the hot and humid conditions and took the women’s title. She won in 3:59:39, two minutes ahead of Gabriele Mijangos and Bianca Inigo Gomez (both from Mexico). Just over 2000 of the 2400 registered riders who traveled from over 40 countries finished the race. The event offers completely closed roads with a choice between the 160km “long route” (two loops of the island) and the 80km “medium route” (one loop). Both routes start and finish in the heart of the town of San Miguel de Cozumel and circumnavigate the island through tropical rain forest and along the 20km-long spectacular ocean front on the island’s uninhabited east coast. While just a few riders were in the hunt for the overall win, there were many aiming to finish among the top 10% of finishers in their category to qualify for a racer corral spot at the Campagnolo GFNY World Championship in NYC on May 21, 2017. 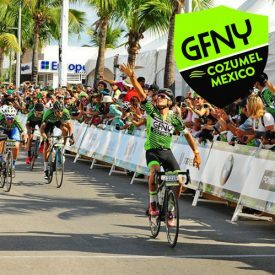 GFNY Cozumel powered by Powerade concluded the 2016 GFNY World calendar of events. Riders celebrated this occasion not only by racing hard but also by partying hard at the post race party held at the legendary Señor Frogs.